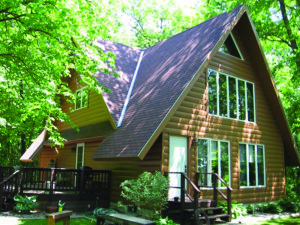 In an effort to capture the log siding look popular in mountainous regions, ABC Seamless of Albuquerque offers a seamless steel variant to homeowners in Rio Rancho, New Mexico, and the surrounding areas that matches the authentic aesthetic but without the issues associated with real wood. Most importantly, as with all our seamless siding, it requires little maintenance – meaning that you will never need to paint, stain, or scrape your new siding once it is installed. If you are interested in installing log siding on your home in Rio Rancho, NM, or a surrounding area, contact ABC Seamless of Albuquerque today for more information. Stop by our luxurious showroom, which is open Monday through Friday or anytime by appointment, to see all of our products in person. Be sure to ask about the financing options we offer to those who qualify.